A View of Downtown Vancouver from Jantzen Beach (Hayden Island). Vancouver, Washington is a United States city, just north of the Columbia River in the state of Washington. It is directly north of Portland, Oregon and 305 miles (491 km) south of Vancouver, British Columbia. Both cities were named for George Vancouver, a British explorer and sea captain. The city of Vancouver includes Fort Vancouver, begun by the British Hudson's Bay Company in 1824. It was made part of the United States on June 15, 1846, as part of the Oregon Treaty. 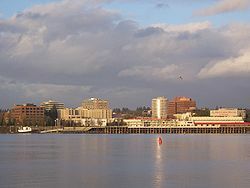 It is the fourth largest city in Washington State. The Vancouver area was home to Native Americans before the arrival of Europeans. Chinook and Klickitat tribes called this area "land of the mud turtles" before 1775. Disease killed most natives before the Hudson's Bay Company came in the 1820s. The Hudson's Bay Company built Fort Vancouver to trade in beaver skins, which were used to make top hats. Workers at Fort Vancouver came from England, the Sandwich Islands, Scotland and Canada. Many trappers had native wives and lived outside Fort Vancouver. Americans began to arrive from the Oregon Trail. John McLoughlin was head man at Fort Vancouver and helped the Americans with tools and seed. Fort Vancouver closed in the 1840s. The city of Vancouver was incorporated in 1857 and was over three times as big by 1909. In 1917, the first bridge connecting Oregon to Washington over the Columbia River was built from Vancouver. In 1982 another bridge was built a few miles east for the I-205 freeway. City of Vancouver as shown in 1888. Columbia Barracks became Vancouver Barracks and was the biggest US military base in Oregon, Washington or Idaho for many years. During World War I the Vancouver Barracks had a lumber mill to cut spruce wood to make biplanes. Another ship yard built ships for World War II. Shipyard workers came and Vancouver grew from 18,000 to over 80,000 people. Vancouver grew again and in 1997 grew again to almost its present size. About half as many people live just north of Vancouver as live inside the city. About one in three Vancouver workers have jobs in Portland, Oregon. Vancouver is located at 45°38′1″ North, 122°36′11″ West (45.633743, −122.603011). Vancouver is just north of the Columbia River and west of the volcanic Cascade Range mountains and the Columbia gorge. Vancouver is about fifty miles from the Pacific Ocean, which gives it rain. Because it is in a valley between the Pacific Coast and Cascade mountains, there are clouds in winter. When it is clear one can see Mount Hood, the Mount Saint Helens volcano and Mount Adams from Vancouver. 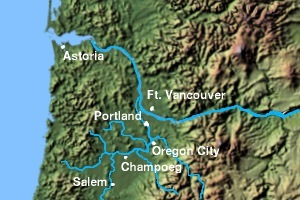 Vancouver is north of Portland, Oregon and shares a similar climate: wet from November through June and dry from July through October. Vancouver has snow once or twice a year, on average. Vancouver has a total area of 46.1 square miles (119 km2). Abuout 7% is water, including Vancouver Lake to the west. Fort Vancouver National Historic Site also has many structures, rebuilt as they were in the 1830s. ↑ "City Charter – Article I Government". ↑ "Vancouver in Tune to Past, Future". The Columbian. September 2, 2007. ↑ "Sten to Propose Renaming City". BlueOregon. April 2005. ↑ "US Gazetteer files: 2000 and 1990". United States Census Bureau. 2005-05-03. Retrieved 2008-01-31. Wikimedia Commons has media related to Vancouver, Washington. This page was last changed on 1 July 2018, at 06:19.